Elastos DMA is a completely open and decentralised digital marketing and community development platform. DMA establishes an intermediate protocol layer which supports digital assets and personal data management based on the Elastos infrastructure. Run by code, DMA serves to enable direct communication between businesses and consumers; create effective pair matching, and transmit value simultaneously. The DMA infrastructure acts as a middle layer which other applications can utilise in order to seamlessly integrate Elastos-based services, such as the Elastos blockchain and smart contracts. Such integration provides applications with the ability to ensure secure exchange between individuals. Firstly, it is a purely community driven initiative, supported by the Elastos foundation through strategic partnership with StarryMedia. The DMA team defined and developed the DMA project in a very short time period, and delivered each milestone on time with quality. This sets a good precedent for building the Elastos ecosystem by active community members. Secondly, DMA is positioned as one of the core Elastos services. The architecture of DMA is fully integrated into the Elastos framework. It is an important layer between the Elastos infrastructure and any dApps in the ecosystem. DMA is technically advanced in the space and moving towards the market steadily, but surely. As stated in the DMA white paper, DMA will support a wide range of use cases, enabling the dApps and associated businesses in the decentralised marketing and commerce domain. The details of these cases can be found in the articles published on our Medium page. 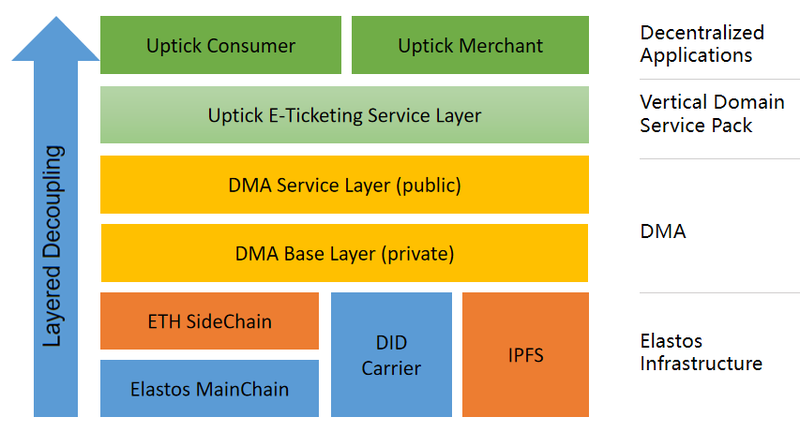 To illustrate and demonstrate the functions of DMA’s asset management capability, the DMA team have built a pilot platform focusing on e-ticketing for the vertical market. This use case includes performances; live shows; sporting events, and ticket management for various gatherings. DMA can help the event ticketing platforms tokenize the tickets, making it extremely easy for selling in the online ticketing platform. The e-ticket can be easily sent, transferred, sold and bought among people in secondary market. The original ticket issuer can put restrictions on the e-ticket, such as frequency, liquidity, and price range of the ticket. This kind of asset should follow a non-fungible token standard. This leads us to the first decentralised e-ticket dApp: Uptick. A decentralised marketplace for buying and selling tickets. We welcome business owners to join Uptick and run their own business on the platform. People can also develop their own ticketing dApp based on Uptick. Eventually we aim to be the enabling layer for local businesses to create their own ticket dApps across all regions. Uptick is just a vertical domain that DMA covers. We hope that people can get inspiration from Uptick and come up with even more innovative dApp projects. While the Elastos core team is working hard on making the Ethereum sidechain and distributed storage ‘Hive’ readily available, DMA has built its own private Ethereum sidechain and IPFS storage for the beta period. We will then switch to the Elastos ETH sidechain and Hive when they are ready. The early access test with the Elastos development team will be scheduled in Q1. DMA 1.0 includes the base layer and the service layer. The base layer connects to the Elastos infrastructure and provides private API’s to its service layer. The first 5 modules are general purpose for all vital aspects of digital asset management scenarios. The experienced developers can use them to compose their own business modules. The merchant module is the all-in-one pack with all merchant-related business logic. It can be a quick jump start for developers who don’t want to rewrite merchant related logic based on those general purpose modules. As the DMA platform evolves, we believe there will be more ‘all-in-one’ pack modules like this merchant module, such as: auction, e-commerce, DRM (Digital Rights Management) market, target marketing, etc. We hope the developer community can join us in building these use case oriented modules together down the road. Uptick is the pilot dApp powered by DMA. It has its specific ticketing service layer, and also the clients for merchant and consumers. Uptick is moving the global ticketing industry forward, bringing business value to the next generation . We will form the Uptick project in February 2019 with a real business plan. It will provide Uptick platform services to the industry, and also run the anchor dApp Uptick in the market. The project development and operation model will be community based. Everyone is welcome to join the Uptick project, and together, we can uptick the ticketing industry. Due to the long holiday season of Chinese New Year, the materials will be gradually published within 2 weeks. All materials and the updated road map will be available at the official site www.elastosDMA.org. As the DMA 1.0 Beta is released, we decided to launch the EAP (Early Access Program). It aligns with the main goal of Q1 2019: Release the stable version of DMA 1.0 and launch several commercial dApps with partners. We want to pick 3–5 community projects and provide strong technical support. We believe this is the right launching process for DMA 1.0 and the dApp community in order to hit the market with success. We hope to receive your messages, along with your proposal before the end of February 2019. The EAP also includes the business development and localisation of Uptick. We think this open and decentralised platform should be operated by the community in a decentralised way. We don’t need to create another monopoly for the future. We want to grow this platform for everyone, benefiting all regions long-term. Please join the EAP by sending us your email to: EarlyAccess@elastosDMA.org.